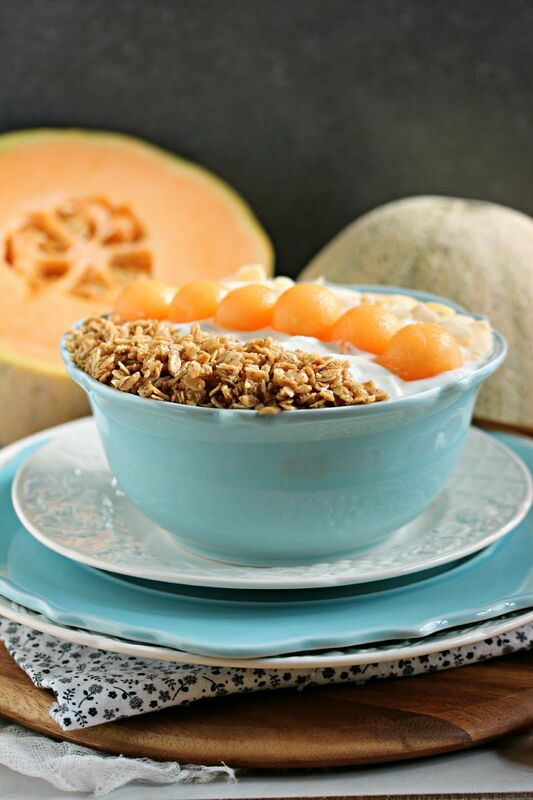 Easy and quick recipe for a healthy breakfast using fresh cantaloupe. I’m thrilled to have created this recipe for Produce Made Simple. It’s quick, healthy and seriously filling. Perfect for those busy mornings when you’re in a rush. One thing my closest friends know about me is that eating breakfast does not come naturally to me. I’m not a big morning person at all. I’ll admit I never have been. However when you have a hectic life like mine you learn that grabbing a bite to eat in the morning is imperative. It’s the key to a successful day quite frankly. I’m super picky what I eat in the morning though. I have some pretty severe tummy issues so I try to eat things that calm the beast within. Fruit and yogurt work perfectly for that. I’ve been eating cantaloupe for breakfast in various forms for about 25 years. I love the flavour of it, it makes my sweet tooth super happy. I honestly never stop craving it. One of my favourite ways to munch on cantaloupe is to make breakfast bowls that use tons of it. You can use plain yogurt and jazz it up with some spices, like cinnamon. I love mixing in other healthy ingredients that compliment my favourite fruit. 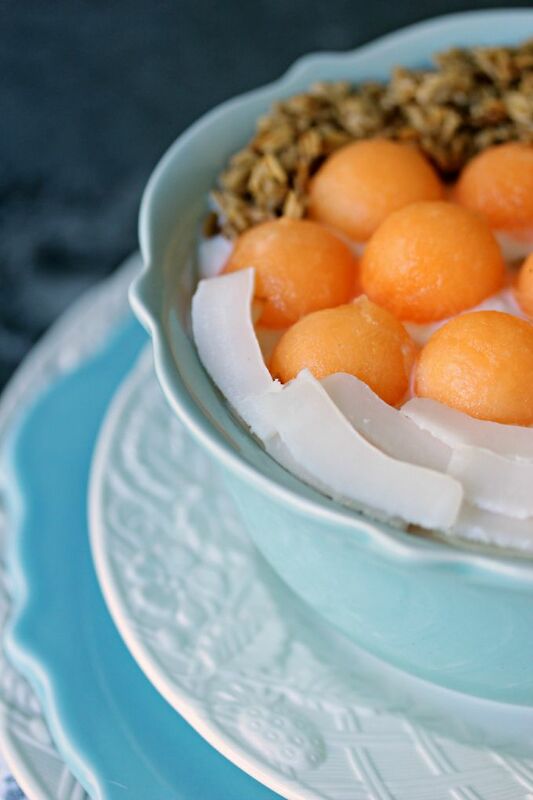 One of my favourite things to pair with cantaloupe is coconut. It really goes perfectly with it. The possibilities are endless when it comes to breakfast bowls. You really can customize them any way you want. For me cantaloupe will always be the ultimate way to go. I hope you whip one up today. 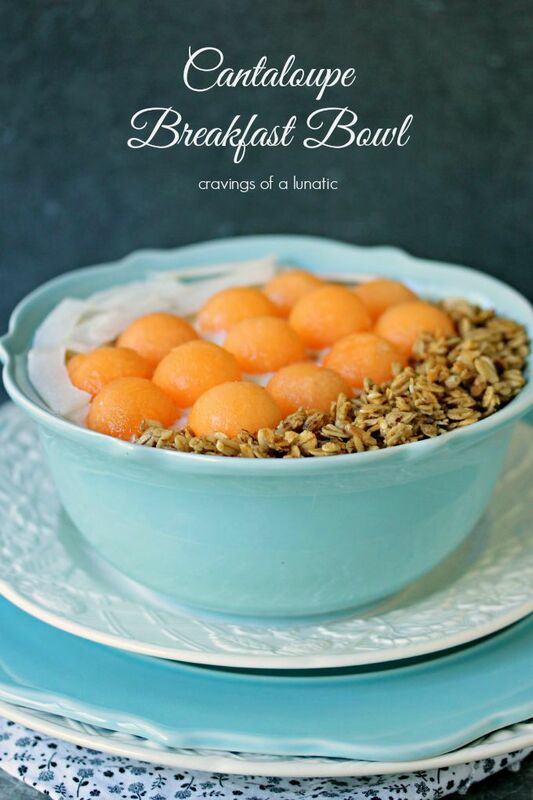 You can find the recipe for my Cantaloupe Breakfast Bowl over at Produde Made Simple. I developed this recipe for their website. Swing by their site for more amazing recipes. You can follow them on Facebook, Twitter, Pinterest and Instagram. I have more amazing breakfast recipes coming at you soon. My daughter is back from military training and let’s just say she now loves mornings and breakfast. Maybe I should join so I can become a morning person too. Nah, probably not. 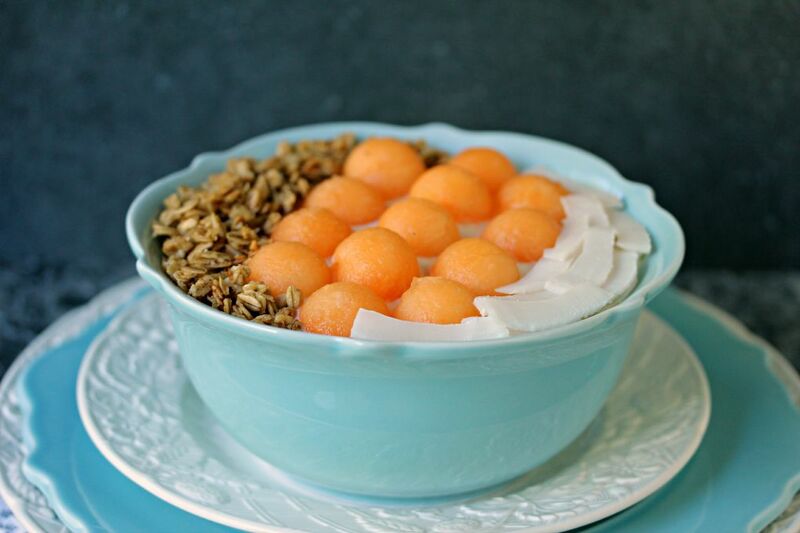 I’ll just eat Cantaloupe Breakfast Bowls for breakfast! Disclaimer: This post is sponsored by Produce Made Simple. All thoughts and opinions are my own, as always. Thank you for supporting the brands that make Cravings of a Lunatic possible. That looks so good! What a great way to start the day! Thanks Carrie. 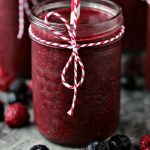 I love this recipe so very much!!! Yay for breakfast and yay for cantaloupe! You know, I never thought to put it with yogurt? Where has my head been at? Sounds delish! Thanks Bobbi. I am SO in love with this one. Also really good with strawberries. Now get your head together and go whip this up woman!!! I never used to be a breakfast person, until I had a little one. Every morning, now, we have fresh fruit as part of our breakfast. She loves yogurt too, so this is definitely a winning combination. My family doesn’t like cantaloupe but the toddler and I love it! I always include fruit, I can’t help myself. Even when we host huge brunches for family and friends I always put out tons of fresh fruit. It makes breakfast feel like dessert or something. Ha. I’m a big fan of breakfast bowls. They are so trendy now. It cracks me up because moms have been making them forever. The internet has taken them to new heights, they are an art form now. I love that your toddler loves cantaloupe. It is SO good for you. When I’m in workout mode I eat about half to a full one every day. For some reason my body craves it when I work out. They get pricey here in winter though. But I eat them anyway. Ha. Those little cantaloupe balls are so cute :)!! Definitely a fun addition to this breakfast bowl. What type of coconut yogurt do you use here? Ha, thanks Brandon. I love making them for some reason. I think it’s that repetitive thing, gives the brain a break for a bit or something. I used Activia because it’s yummy, available in Canada and I can buy a massive tub of it. We have a pretty great selection of yogurts in Canada but it pales in comparison to the variety in the states. I’m always blown away when we shop stateside and the aisles are filled with so many different choices. I get giddy about halfway through our shopping trip, then start embarrassing the family with my excitement. 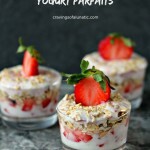 I love using the cherry yogurt with granola and coconut too. It’s so good. Thanks so much! I love cantaloupe for breakfast. My go to, along with bananas. And strawberries. I adore fresh cantaloupe and it is also one of my go-to fruits for breakfast. I’m heading over to check out the recipe now. Me too Renee. It’s my favourite thing to eat in the morning and I’m not naturally a morning eater. Hope you love it. Thanks for commenting. For a lady who is not a morning person you sure did manage to make breakfast look like the most appealing meal of the day!!! 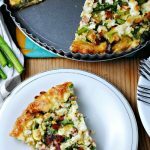 I am heading over to Produce Made Simple right now to check out the recipe and see what other goodies they offer. Ha, thanks Betsy. When I do make breakfast I like to make it a bit out of the ordinary. 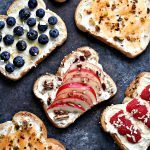 You will love the recipe and I’m positive you will love their website. It’s so amazing. I don’t like to eat first thing either! Sadly I’m stuck in a household where 50% of the humans wake up hungry (and 66% of the dogs!). The best trick I’ve found is to get up earlier than them, so that by the time I am ready to ingest food they are up and ready as well. Probably wouldn’t work with your night owl schedule–I am becoming more and more of a Lark as I get older. 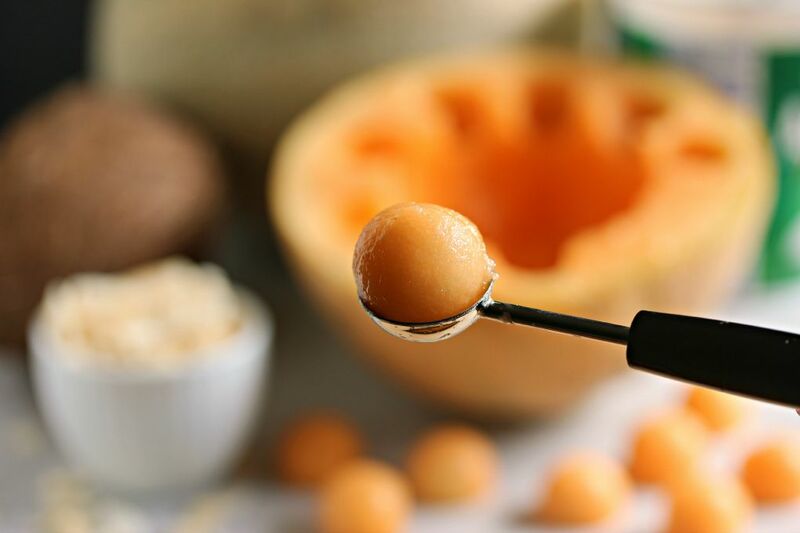 The cantaloupe in the farmers market looks so amazing–this recipe sounds like a delicious way to enjoy what’s in season. Thanks! I hear you. My family are all morning lovers and morning eaters. I’m not. At all. Even when I’m up early, which is often, I still don’t like to communicate before noon. Ha. It goes back to when I was wee little. Up until last year I’ve gotten up at the crack of dawn forever and I still rarely speak before to anyone till about 10 at the earliest. I just sort of muddle through life quietly wishing I could sleep in. Ha. The kids just laugh. About the only time you’ll see me on social media before an acceptable talking hour is if I’m road tripping. The odd time I’ll post on instagram when we road trip. But I post and run, because I can’t be responsible for what comes out of my mouth early in the day. Ha ha ha. Horrible but something I’ve just learned about myself over time. Getting up with kids for 25 years and I still never woke up happy and chatty. So weird. Just not in me. Call me at 3 am and I’m chipper. Go figure. I love the cantaloupe this year. It was super sweet here. Except for one we bought that was oddly mild. I could eat it morning, noon and night. And usually do. 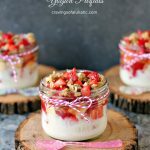 I love easy and healthy breakfasts and this is a winner!! Thanks Kathy. It ranks right up there with your Mojito Overnight Oatmeal. I love that stuff. Gorgeous photography. I love cantaloupe and wish I ate more of it. This will help with that. Thanks so much Michelle. I can’t get enough of it. So good. Thanks for swinging by. I wish I was a breakfast eater, but I really have to force myself. Even though I am looking at this early in the morning, it is already making me hungry. Wish I had some cantaloupe. I would eat breakfast right now. Me too. It’s pure force. I do better when I’m working out. If I’m not it’s harder to force. But I’m always happier when I do give in. You will love this. 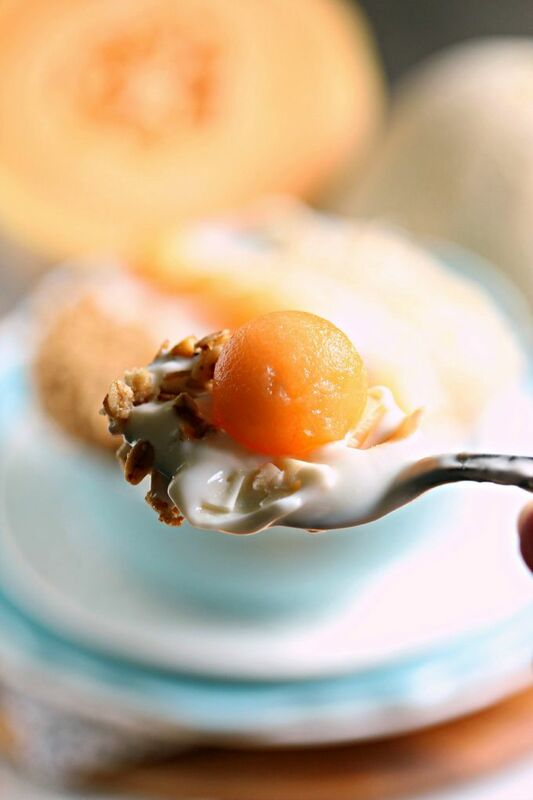 Nothing better than healthy yogurt and cantaloupe in the morning. It’s so yummy! Oh my gosh, I saw this on your facebook and fell in love! I really wish I was having this for breakfast this morning! I’m not a morning person either and I’m always struggling to find something to eat in the mornings! Thanks so much Angie. It’s my favourite way to make sure I get breakfast in my belly. Cantaloupe is SO yummy. Hubs knows to pick them up for me any time he’s at the market. I can never get enough of it. It’s funny how some of us just never get used to it. We’ve done the get up early thing my whole life and I still dread mornings. This past year has been nice because the kids are older. One is away at school and the one who is here goes into the U later so we don’t have to get up at the crack of dawn every day. But then she was in military training for 4 months and now she’s set on keeping with the schedule. So I think I may just get up with her and work out in the morning. Grumpily, I’m sure. Cantaloupe is just the best in the morning. I have a crazy tummy and it never upsets it. It always calms it down. Love the stuff. I’m a big breakfast eater – and it’s time to shake things up by trying something new…like this breakfast bowl! So pretty too! That’s so awesome Martha. I’d love to embrace mornings and breakfast more gracefully than I do, but I’m such a night owl. No clue why. Luckily I’m not much of a sleeper so I can stay up late and still get up early. I’m one of those weirdos who can function well with less sleep. But only for so long then I need one good night’s sleep again. I wish I could trick my inner clock but it never works. I always cheer up once I have some fruit in the morning. I’m a grumpy pants till I get a little sweetness in my belly. So ridiculous but SO true. I never think to put cataloupe on my oatmeal, but it sounds like a terrific breakfast topping! You could totally put it in oatmeal too. And smoothie bowls. Scrumptious.